August 16, 2018 by Susan G.
Ultimately, anybody who is reading this blog post, and anyone who has or is reading The Compassionate Equestrian can visualize themselves as compassionate and empathic with horses. If you feel as though you aren’t there yet, you’re certainly on the journey to becoming more understanding of your horse’s needs and his means of communication. Unfortunately, however, it has been brought to my attention that the very word, “compassion” seems to evoke a broad range of emotions and opinions from equestrians, and not necessarily on a positive note. Does it have a religious slant that distances some riders? Do some feel that it means you can’t ever show a horse without having “do-gooder” looking over your shoulder? Does it mean you can’t achieve optimal results within your chosen discipline? Given the conversations I’ve had with one of our younger trainer-affiliates, it seems as though all of the above applies. This saddens, yet does not surprise me. We all know what the horse industry needs. From the highest echelons of the governing bodies of horse sports to the backyard recreational rider, we must have clarity, best practices, and enforcement of the welfare issues across the board that would help make this a better place for horses. Horses that are receiving at the very least, a home that provides them with the 5 Freedoms*. You only have to scroll through a few Facebook threads or online forums to find out what the extent of violations are though, even with just those five essential principles of animal welfare. So let’s just drop the word, “compassion” for a minute. How about we replace it with… “kinder?” The kinder rider. How does that look? I realize that not everyone who has a horse actually rides them as well, so we’ll include those who wish to work at liberty or simply maintain horses as companions and provide them with a safe home. We imagine that a beautiful partnership must originate and equate with a kind and benevolent rider or handler. I guarantee you, however, that the perfect picture also has the tough parts, the ugly sections, the down moments, and the ones that make you just want to give it up. Everyone has those times too. What helps? That base of kindness, starting with being kind to yourself. a kind and loving person. Seems to fit with our Principles, right? Now, without judging the tack, the discipline, the breed, the person sitting in the saddle, observe the situation in question. You can be a very kind person, and still end up in trouble on a horse. The horse may not have had adequate training, he might be in pain, he might be too much horse for the rider, or he might have spooked at something and bolted. If you happen to be a very kind person and a competent rider, but your young horse decides to have a bucking fit at a show and someone snaps a photo of you pulling on your reins and posts it on social media with disparaging comments, does this then make you an unkind, non-compassionate rider? No, of course not. You did your best in a testy moment, and the next thing you know, you are subjected to hateful comments in a Facebook group. Everyone else thinks they’re being compassionate with the horse because he’s being pulled on, not knowing what might have happened in the split second before the photo was taken, or the moments that followed. And no, this is not compassion. Remember, compassion is putting yourself in that saddle, in that moment. It’s not about feeling sorry for the horse and trashing the rider. Who, in fact, may truly be a kind and benevolent rider. Where am I going with this? Well, I’d like everyone to consider the basis of what makes a kinder rider, and we’ll just sneak in the core of the 25 Principles of Compassionate Equitation. We don’t need to say it, we’ll just do it. Take a few moments and some deep breaths when you feel the need to criticize another rider or horseman. Do the same before you engage with your horse to ensure you are calm, quiet, and thinking clearly. Examine yourself and your connection to the horses you work with. 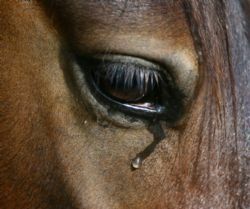 Certainly, there is no book, DVD, author, or online training program that is going to encourage you to be outright unkind and cruel to your horse (although if anybody comes across anything that promotes the deliberate causation of pain to animals, action should be taken with appropriate authorities). The big problem we have in the equine industry right now is a disconnect from the fundamental training principles that are first of all concerned with the soundness of the horse and his ability to perform tasks required by the trainer/handler. The second issue is the misunderstanding of biomechanics and the progressive development of the musculoskeletal system of the horse that is tasked with working with humans in any capacity. Too many trainers are missing the years of correct training of the rider before they are able to transfer that knowledge to the education of a horse. Even horses working at liberty are subject to these principles, as they are required to maneuver through various gaits, obstacles, school figures and other unnatural exercises that may overtax tendons, ligaments and muscles. A kinder rider knows that they need the basics of good equitation that will provide them with an independent seat, quiet hands, and correct application of the aids. It doesn’t matter if you ride bitless or show jumpers. You can’t replace the foregoing with anything else. A kinder rider continues their education in their chosen discipline, always seeking to further understand the needs of their horses, and developing the ability to know when they can proceed with the horse’s training, and when they need to back off. A kinder rider knows that not everyone has perfect moments with horses at all times. Even the nicest horses can be out-of-sorts, especially if something hurts. It is important to realize that even horses trained with zero pressure can injure themselves. They’re made of the same soft tissue, bone, and other biological components as we are. A kinder rider enjoys the success of others and seeks out the experts who seem to have a history of keeping horses sound and content, even competing well in the show ring for many years. Horses that have been overworked, beaten, or poorly trained will show it. Sooner or later, even the most stoic ones will break down and expose the rider or trainer for their bad handling. A kinder rider encourages others, especially youth, to follow their heart when it comes to engaging with horses. If a child wants to jump their pony, find them a pony who loves to jump and ensure that they are trained under the supervision of a benevolent trainer. If the child announces that they no longer wish to jump or ride, allow them to bow out with grace. Same with other disciplines. If the trainer is mean, insulting, never seems happy, please go somewhere else. Even if they produce the desired results and ribbons, everyone will suffer at some level. A kinder rider is compassionate. There. I said it anyway. If you want to be stealth about “compassion,” I think kindness will suffice. And I think you’ll experience some pretty good results. 2.Freedom from Discomfort by providing an appropriate environment, including shelter and a comfortable resting area. 5.Freedom from Fear and Distress by ensuring conditions and treatment which avoid mental suffering. Susan Gordon is 58 years old and lives on Salt Spring Island, B.C., Canada. She turned professional as a rider in 1983, upon the invitation of Maclay champion (1973), the late Michael Patrick. Susan trained eventing, hunter, jumper and dressage horses, apprenticing with other top trainers in her chosen disciplines. She created “Athletic Rider Training; The ART of Horsemanship,” teaching freelance since 2002. Her program brings elements of meditation practice, music, dance, art, and an interest in non-invasive, holistic therapies—in particular Low Level Laser Therapy and EFT tapping— to her work with students and their horses. She has since completed courses in Sustainability (University of British Columbia and University of Guelph), and documentary filmmaking (Pull Focus Film School, Vancouver). She is a Trained National Canadian Coaching Program Endurance Coach, an internationally ranked competitive masters and age-group runner with Athletics Canada in the 400m track to ½ Marathon Road Race distances. The Compassionate Equestrian is her first book. Her second book also released in June 2015: Iridescent Silence of the Pacific Shores (Gordon/D. Whalsten 2015), a book of abstract water photography with a strong environmental statement, and DVD featuring original Orca calls and music composed by Ron Gordon, Ph.D.
August 27, 2014 by Susan G.
I spent the past two weeks in the busy, crowded city that is my hometown. It is allegedly the 3rd most livable city in the world, yet I barely got any sleep due to the sheer amount of noise and constant attack on every sense. Even on the paved suburban forest trails near my brother’s home, people are distracted by their smartphones and controlling their dogs while balancing Starbucks coffee cups, many simultaneously pushing strollers with toddlers in tow, dodging cyclists and runners on the pathways. Near the house, tunnel construction for the new transit line operates through the night, while trains run hazardous materials through the terminal at the water’s edge and large tankers loom in the distance. “Survival” is the word that comes to mind in an overstuffed urban setting. Although I’m told Vancouver is nothing like Shanghai or any other enormous metropolis with millions of residents. It is a wonder to me that people don’t go completely crazy when everywhere you go it is shoulder-to-shoulder and very high-density living. Or maybe they do, as I think back to the expressions of obviously over-committed suburbanites on the trails. So when I found out it was “Horse Day” at the Pacific National Exhibition, I decided to attend since the fairgrounds were accessible via public transportation. This particular route into the downtown area is particularly challenging for drivers of cars and busses, as shortly past the racetrack and fairgrounds is one of the worst sections for homeless people in pretty much any city in the civilized world. People who are mentally ill and/or under the influence of mind altering drugs and alcohol spill from the sidewalks on to the streets, and at any given time of day, a sense of mayhem ensues. The bus was standing room only on that Wednesday morning, and it was hot. I got off a block early simply to get relief from the heat and the packed vehicle. I knew exactly where I was headed and easily navigated through the usual array of food stands, vendors hawking all kinds of fascinating, tacky objects, colorful rides with screaming patrons, and chatty teenagers looking forward to a fun day at the fair. Up ahead was Hastings Park racetrack with its deteriorating barns and uncertain future, hidden by the cupped roof of the old Agrodome and high fencing. The PNE had been a tradition in my family as early as I could remember. Mom took my brother and I there every year, with Dad dropping us off at the main gate, as he did not enjoy the racket, the rides or the exhibits. As an adult, I was showing horses in the annual competition, many of which were thoroughbreds that had previously raced on the track next to the agricultural building. They were frequently unnerved by the proximity of the track and the cramped, dark, smelly barns attached to the Agrodome’s indoor arena. 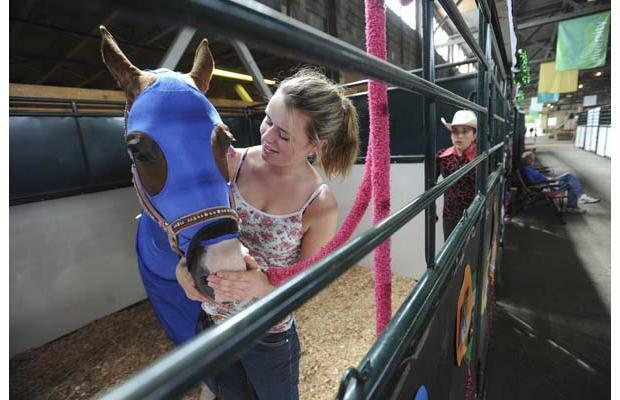 Horse Day in the PNE Agrodome, Vancouver, B.C. I entered the barns and made my way past the goats, cows and chickens, up to the horse stalls and the Horse Council of British Columbia’s display of breeds and horse-related businesses. I was impressed with the selection of brochures that were clear and concise with regards to safety, nutrition, and guides for new or newly interested riders. Many breeds were represented, as were a number of disciplines, each taking turns in the big arena with the huge domed roof. It was always an odd experience riding in there, as the acoustics amplified every footfall of the horse and every breath you took. I could see the stress in the horses that were in the tiny stalls, as groups of school children made their way through and sounds from the midway rattled down the shed-rows. Everyone survived their demonstrations however… the Pony Clubbers jumped and nobody fell off when the odd pony decided to buck, the vaulters performed without a hitch, and in spite of a raucous Friesian foal, everyone held it together during the parade of breeds. I returned to the barns afterwards to look at more horses and chat with some of the riders, and noticed a small pony with a watery eye. I looked closely and saw there was a chunk of alfalfa hay stuck to its eyeball, probably only minutes earlier as the irritation appeared fresh. The piece of hay was not budging as the pony blinked, trying to relieve its discomfort. In the next stall was one of the young Pony Club riders who had just returned from the arena. I asked if the pony in the next stall was hers. It was. Then I suddenly felt like I had a bit of dilemma. Obviously, the most compassionate thing to do for this little guy was to get the foreign object out of his eye and relieve his pain. The stream of fluid was now running all the way down his face. I remembered how annoying it was when I was showing horses at the fair, as members of the general public would come up with all kinds of strange things to say. We would all be tired and somewhat on a short fuse after being in those noisy, smelly, crowded conditions for even a day or two, and then have to deal with people and their opinions on top of that, some of which were inadvertently unkind, or at best not very mindful. I thought the least I could do is try to sound as caring as possible and not appear to be judgmental or blaming, knowing how sensitive horse-people are when told something may be “wrong” with their horse. I couldn’t believe the memories that were coming back and how I felt when somebody just “had to” tell me about something that, in their opinion, was wrong with my horse or something I had done was incorrect. I told the young lady her pony had a piece of hay stuck in his eye and that the eye appeared irritated as it was now watering profusely. Blank stare. I repeated myself. She said “oh, he got very upset when the other horses left for the arena.” I acknowledged her statement and agreed that the environment in the Agrodome and barns was very stressful for horses. I mentioned again that perhaps she should take a look at her pony’s eye. She thanked me but still did not leave the stall of the other horse to check on the pony. So I left, and can only hope the eye was properly taken care of. In The Compassionate Equestrian I have written, from experiences of my own and those of others, that as much as we want to “help”, sometimes it is construed more as “unsolicited advice” and not necessarily welcomed by the recipient. In the horse world, “helping” when you are not being asked for assistance, can be dangerous. I knew of a rider who was trying to get her horse over a jump at a show when somebody on the ground decided to cluck and encourage the horse to go forwards. It bolted through the jump, and then the rider fell off, sustaining a life-threatening head injury and long term coma. Many people are very compassionate by nature, and truly do want to alleviate the suffering of others, especially if they have the means to do so. I actually could have gone over to the next row of exhibits and asked the veterinary techs who had a display booth if one of them could help with the pony’s eye. Should I have done that? Or would that have been construed as “interference” and perhaps set up a chain of ethical and moral events that would have caused potential liability issues for myself, the pony’s owner, her parents, and so on. After all, the injury was neither severe nor life threatening and there was no need to involve an authority. There is a law of physics, Newton’s Third Law, which states “for every action, there is an equal and opposite reaction.” This sets us up for a dilemma such as the one I was experiencing when with thinking about caring for the pony and taking action to alleviate its suffering. This makes me wonder if something in the field of consciousness responds to our intentions and the compassionate actions we take, and why we feel compelled to do or say something to another person or horse if we perceive them to be suffering. What are the consequences of the action we take, if we are even privy to know those consequences? Could this have anything to do with the “human condition” and why it may be so difficult to solve some of our most pressing issues of humanity? Of course I would not have expected anything in return for helping the pony, nor do I ever expect anything in return for assisting someone or an animal, yet don’t we at least expect our good intentions to result in positive feelings and an increased awareness of gratitude for both our own lives and the lives of other beings? I left the fairgrounds and the horses behind, getting back on the same bus route that continued into downtown. A mile or two down the road was the sight that never fails to make me stare in disbelief. There are hundreds of people out on the streets, many of who are in terrible mental and physical condition. They are addicts, mentally ill, destitute, and homeless. Every time the city adds housing or more care, more people appear looking for assistance. It has been like this for decades in this otherwise bright and shiny west coast utopia; a blight on the city’s “green” image and international reputation. It is overwhelming, and it seems endless, no matter how many people the agencies, the city and individuals try to help. The film school I went to is only a block from this district, and it is a frightening place to be. When I see these people, I wonder if any amount of compassion can save them. It is no wonder so many care givers, both of human and of horses or other animals, can reach a point of complete exhaustion and “compassion fatigue.” There seems to be an endpoint to the amount of personal and emotional resources we are able to give to others, in spite of our best intentions and desire to help everyone and every animal in need. It is like a short documentary about an “unsung hero”, an extraordinarily compassionate young man who gives everything he can to help people in need and those less fortunate than himself. It is a well-done story created by Thai Life Insurance as an advertisement for their services. Their motto is “Believe In Good.” The script, music, the close-ups on the eyes of the giver and his recipients are all elements of a cleverly crafted film, exemplifying everything I was taught in film school that makes for a impactful message. It makes you believe that everything you give, and everyone you give to will result in a positive return, for the benefit of all those involved. It makes us admire the compassionate young fellow who neither asks for nor receives anything material in return, and we weep at the sight of the young girl who rises from poverty to become a scholar at the end of the story. We really can believe in good after watching this narrative video. When Dr. Schoen sent me the video for discussion, it was embedded in the San Francisco Globe’s blog page, which sports a number of stories with headlines designed to “hook” a reader. The kinds of headlines that really draw your interest and make you want to click on that link. Looking at the comments below the video, we are reminded of the “human condition.” Some people react as though the actor in the commercial is actually a person in real life doing all of these daily good deeds. They seem to be unaware that it is an advertisement for an insurance company. Yet others who have made comments are aware of the commercial context, and have made the kind of comments that raised ire in those who believed the young man to be legitimate. To get the code to embed this video, I went to the YouTube site, and found, as expected, an even broader array of interpretations and comments, ranging from the very tearful and emotional to degenerative uses of language and harsh judgments of others. Sigh. Yes, the human condition, and the filters each one of us comes through. We know that “compassion fatigue” is a legitimate term. Dr. Schoen has experienced it as a caring veterinarian doing his absolute best for animals and I have experienced complete burnout as a horse trainer, leaving the equine world several times. We have to ask, what are the real benefits, in the real world, of our offering of compassion to other sentient beings, and how do we do so without expending our own selves to the detriment of our own health and welfare? What about those horses that are asked to work for many hours with a herd of distressed humans who are looking to them for compassion and psychotherapy? 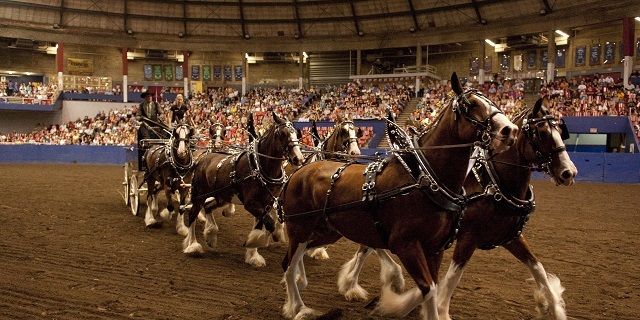 Do those horses experience compassion fatigue and burnout too? Chances are they do if we compare their tasks with those of captive zoo animals, as research with “enrichment programs” for the animals’ environment has discovered. In developing our compassion, how do we apply ourselves to real-world situations, knowing that it would be almost impossible to cultivate the degree of loving-kindness exhibited by the fellow in the insurance commercial? How do we apply ourselves to offering compassion in the horse world without appearing to be interfering in somebody else’s affairs, giving unsolicited advice, or even offending others who may not actually be suffering in a way that we think they are? How do we avoid the effect of Newton’s Third Law as a consequence to our compassion? I have been thinking about this a lot since returning to my writer’s retreat on this pretty little island in the Pacific. The contrast of experiences in the city are still fresh in my mind, and I am actually hoping to catch up on some sleep this week, hearing only birds and waves crashing on the shoreline each morning. I think about all the times I felt compelled to “help” somebody and was given a nasty look, a blank stare, or even a “thank you”, but then there would be other events that occurred as a result. Sometimes it is all too easy to overthink compassionate action, and over-thinking something can be paralyzing. Is it best to simply act, or take the time to go through a list of what might happen if you do? Do you pull that last $5 out of your wallet and give it to the beggar, leaving yourself without bus fare, or do you walk past him, bless him with kind thoughts, and say a prayer for his health and recovery from whatever may be the root cause of his having to beg? Oh my, that does make things a little more complex doesn’t it? Well, life with other life forms actually can be complicated, especially in today’s world of having so many choices available to us in an instant. There are possibly more details involved when offering compassion to others than we may be aware of. Maybe we are more powerful than we could even know, and perhaps there is a “field” of compassionate energy we can work with, instead of giving away our last dollar, exhausting ourselves by taking care of another, or allowing ourselves to be taken advantage of by someone who may see us as a means to support their own wants and needs? Consequences? Besides compassion fatigue from over-caring, there are detrimental consequences to our health and wellbeing if we give to someone or to an animal out of feelings of guilt, shame, or the assumption that we “have to” give to that person or they will no longer appreciate us. In the video the young man was met with a glare from the woman on the street when he hesitated to empty his wallet into her cup one day. It appeared he then felt guilty and gave her the rest of his money. What condition caused the woman to be on the street in the first place? Does the woman he leaves bananas for really use or need all those bananas or do they go to waste? What are her other needs? What is the nature of the young man’s suffering…because we know all beings suffer? Nobody in the comments seemed to feel as though he was in need of compassion himself, or at least no mention was made in that direction. With compassion, there is a benefit in also recognizing wisdom, mercy, and ultimately, love. All of these things we can give and extend to others from our heart, with infinite possibilities and no time or material things attached to them. As we pass by the ill and poverty-stricken on the street, we can offer blessings and prayers that the root cause of their suffering be alleviated, because the truth is, we really do wish for them to be well. It is the same for thousands of horses that may be suffering and in dire straits. The consequences of meditation and mindfulness training are that we begin to realize the subtleties of how effective and how powerful simply using our mind can be. It is not as easy to convey that concept in a short video however, and more difficult to arouse a strong emotional response in the viewer, as was the intention of the insurance company. So with the horses, and with my fellow humans, I try to live with a compassionate heart, and compassionate thoughts at all times. I have learned much from my compassionate co-author, Dr. Schoen in this regard. If I can legitimately help or give my time or finances to someone, I do, but I have had to teach myself (and am still working on this) not to feel guilty or ashamed if I cannot contribute. As most of us do, I get daily requests from organizations seeking financial donations or other commitments. It may be horses, the environment, an international crisis… it is overwhelming. I could have emptied my bank account a long time ago and filled my house with friends or strangers who need a place to stay. I find my greatest power and clarity comes in moments of solitude, and this is where I am most compassionate to myself first so that I can actually be of benefit to others. Less than a whisper, there are messages of love that seem to come out of nowhere, and I feel like I am “home.” I believe that when that feeling of being home in your heart arises, if you stay still and quiet, not necessarily taking action at the time, you will find the magical still-point – and you may call that still-point what you wish (some may say G-d) – and will find the answers as to what you need to do, if anything at all, or if the simple, potent, act of being compassionate within yourself will radiate through to all other sentient beings, for their benefit as well as yours. I also noticed in the video the compassionate young man feeds a big chunk of chicken to the dog. Those of us who have had dogs know not to ever feed them chicken bones because they can splinter and cause the dog to choke. I guess in that way the commercial was also a success…it is a good idea to be compassionate but have insurance too! And I sure hope that pony’s eye got taken care of in due time.